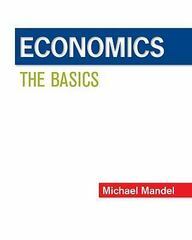 Economics: The Basics 2 Edition Mandel's Economics: The Basics combines the traditional news values of immediacy and impact with a layer of educational explanation to provide a window into what's happening in the current economy. Michael Mandel, the former Chief Economist for BusinessWeek magazine, now Chief Economist at Visible Economy LLC, writes in a journalistic style, drawing upon news articles and experience throughout the text to present economic concepts in a way that is understandable, relevant, and exciting for a broad audience. The 2nd edition's core approach focuses on developing a student's economic literacy without overwhelming and providing a window into what's happening in the economy right now including globalisation and the aftermath of the financial crisis. Mandel's current examples, journalistic writing style, and accessible presentation of math and graphs will help instructors overcome the common challenges of this course, and make the material more approachable and attractive to a wide range of students.